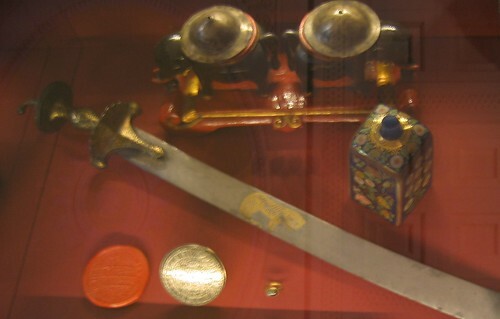 Tipu's sword. British Museum, London. Notice the tiger emblem. Tipu Sultan's legacy has turned up in all of the places I've visited this summer. Tipu was the son of Haider Ali --- a common soldier in the army of the Nizam of Hyderabad who worked his way up to become king of his own kingdom. Tipu, from his capital in Srirangapatanam (near Mysore), put up a fierce resistance to the Brits until his death in battle in 1799. 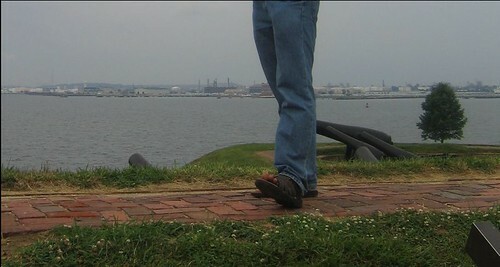 View from Fort McHenry, Baltimore of the harbor and cannons. The first place I visited, and the one with the most tenuous connection to Tipu (which I first learned of here), is Fort McHenry, Baltimore. With the help of Congreve Rockets, the British tried to capture the city of Baltimore (and this fort) from the Americans in the war of 1812. William Congreve invented the rocket (a picture of which is displayed in the fort), when he was fighting on the British side against Tipu in south india, by reverse-engineering and improving on the rockets that Tipu used against them. Above is a view of Baltimore harbor from the walls of the fort. View from Vellore Fort of the town and hill-top fort in the distance. The Brits, with the help of the Nizam's army, defeated (and killed) Tipu in 1799. They kept many of his things, and imprisoned his family in Vellore Fort (a stone's throw away from where I was born and brought up). 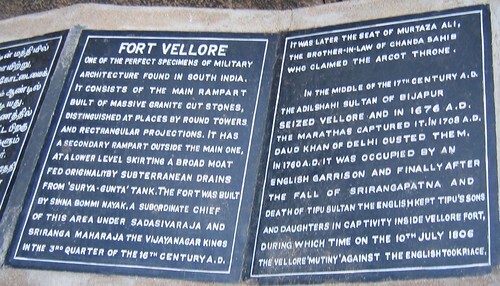 Here's a picture of the inscription in the fort and, above, a view from it's walls. At the top of this post is a picture of his sword that I saw displayed in the British museum in London when I visited recently. It's a little blurry but you can make out the emblem of the tiger (Tipu's personal symbol). Tipu's connections to Hyderabad are strong. His father used to be in the Nizam's army. His brother-in-law might even have been married to a woman from the Nizam's court/entourage --- if the (persian) women of the court didn't look down on him as being of lowly south-indian "peasant stock". (I suspect, like many things in India, this had much to do with skin colour). Tipu tried to convince the Nizam to align with the French and not the Brits, but they didn't listen. Infact they did the opposite and aligned with the Brits in defeating him and, proving Tipu's suspicions right, cheated the Hyderabadis of their conquests. Rather than dividing Tipu's captured territory between them, they gave it away back to the more pliable Wadyars [who were the rulers of Mysore before Tipu came along]. These and other tales of British treachery can be found in William Dalrymple's White Mughals [which I'm back to reading at the moment]. I spent several days in Hyderabad, but was too busy attending, and helping run, a wedding to be able to take relevant photographs. Rather than dividing Tipu's captured territory between them, they gave it away to the more pliable Wadyars. .....shouldn't that read, "gave it back to the Wadayars?". After all....the Wadayars ruled mysore region well before Tipu's time. They themselves were Nayakas (captains) of the Vijayanagar empire, which crumbled, and left the Wadayars to rule the Mysore region. They had a few pretty powerful kings in the mid 1600's (Ranadhira Wadayar comes to mind), before becoming rather weak in the mid 1700's (Haider and Tipu's time). Have a good trip in the UK. You're right Sunil. I've clarified it in the post. Thanks for the details about the Wadayars. 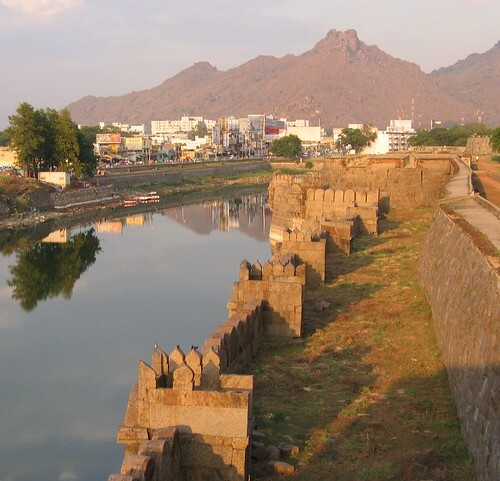 So they were also Nayaks of the Vijayanagaras like the builders of Vellore Fort. The point of the original line was to highlight how the Brits masterfully played the local rulers against each other. As Dalrymple says (p.156) : "The British, however, made sure that the newly reinstated Mysore Rajah would be utterly beholden to his British donors, thus gaining firm indirect control of the land they were puportedly giving back to its rightful former owners." Who Would Jesus Assassinate ?